We’re finally going to send out a newsletter! If you signed up before 2018, sign up again (please and thank you) so we know you’re still interested. The signup is at the bottom of our homepage. 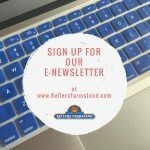 In our e-newsletter, we’ll include tips, advice, farm myths vs. farm facts, as well as behind-the-scenes info on what’s going on here on the farm. Look for the first issue coming soon in your inbox! Our first greenhouse delivery arrived yesterday! 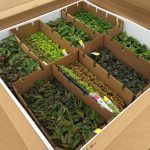 This photo shows mostly coleus and begonias, but we received other plants, too. Today we began assembling mixed baskets. It was 27 degrees outside this morning but a pleasant 72 degrees in the greenhouse. Ahhhh. Need a taste of spring? The Chicago Flower and Garden Show is March 14-18! Use the code in the photo to save money on tickets. 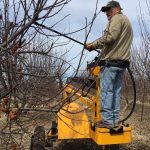 Look for us on the GrowIt! app for flower ideas and info!